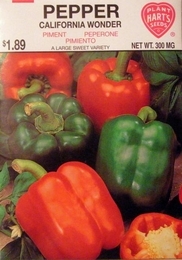 Sweet Peppers are a favorite home garden vegetable. Serve them raw on relish platters, in salads, fried or stuffed. Fruits are approximately 4 inches in diameter by 4 1/2 inches long, mostly 4 lobed, dark green ripening to red.